I left my family at home for a long weekend away to visit QuiltCon West. I've been home for four days and I think I'm still catching my breath. In short, QuiltCon was awesome. I'm both inspired and overwhelmed. So. Much. Awesome. I flew down to Pasadena on Wednesday, checked into the hotel, checked into the conference and grabbed dinner. I proceeded to take 21 hours of workshops over the next three days, plus attending one panel, viewing the whole show and visiting vendor booths. My sister joined me on Friday, when I only had one 3-hour workshop. I left Sunday morning to fly home in time to spend a lovely afternoon with the kiddos, lego shopping and eating out. Did I mention that I'm still tired? As QuiltCon approached I worried that I hadn't left myself any time for socializing. All three evenings I was in workshops, so there was no option for dinner meet-ups. Luckily I ended up in workshops with some members of my Modern Quilt Guild, as well as a couple quilt blogger friends who I hadn't yet met in real life. It was nice to get to know people a little better as well as meet some new friends, but I will definitely not be over-scheduling myself to this degree next time I make it to QuiltCon. I think I missed a lot of great stuff in the lecture and panel offerings, too. I've caught bits of a couple lectures through social media which I've enjoyed. That said, the workshops were great. I started fun new projects and learned some new skills. More on that soon, plus an opportunity to win some of my QuiltCon swag (so be sure you're following the blog so you don't miss those posts!). For now, check out the QuiltCon 2016 winners. I'm linking up to the Week 3 Progress linkup for the 4x7 Sewing Challenge. Posted in Quilting. 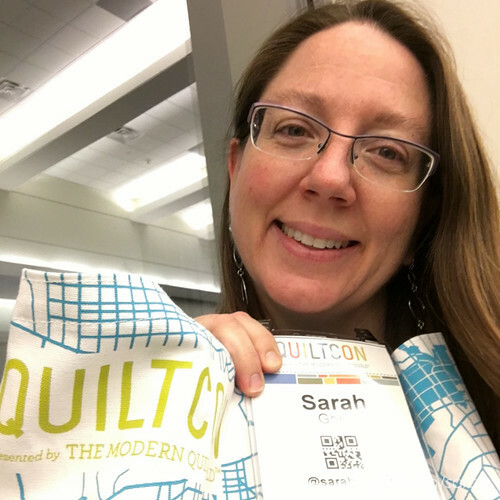 Tags: QuiltCon 2016 on February 25, 2016 by sarah. It sounds like an awesome time Sarah. I'm hoping to go next year! I hope to make it next year too, but Savannah is feeling very far away. Have you been to past QuiltCons? I am so glad we got to meet and bump into each other several times at the show, Sarah. I definitely learn something about how I schedule my time each time I am fortunate enough to attend. I have been falling asleep early all this week as my body is trying to recharge from QuiltCon. I hope you get some rejuvenation and feel less tired soon. It was definitely nice to see you in person. I'm sorry that my busy schedule didn't allow us to hang out for longer. Thank you for being a volunteer! Sounds like you had a great time. Thanks for the tip on scheduling workshops. I'm planning to attend in 2017. I think maybe the take away is: Don't be afraid you won't have enough to do if you only take 1-2 (or even zero!) workshops. Ok, so I will say I was surprised to hear how jam packed your workshop schedule was when you were scoping about it, Sarah, BUT holy cow were you productive! You had so many awesome projects underway from your classes. I am desperate to be at the show next year, but I think I want to strike a balance between sewing and socializing... hopefully I'll get to meet you then!